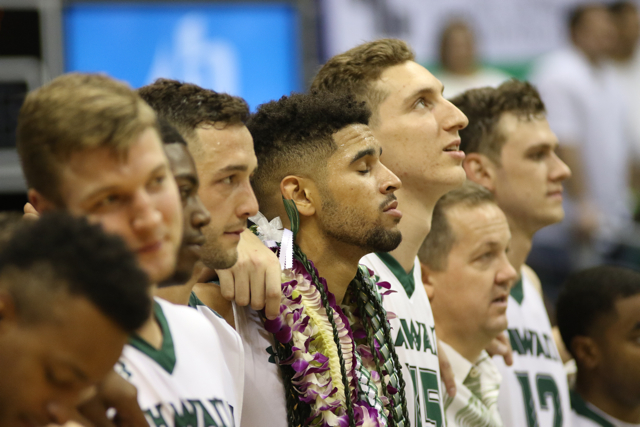 With no idea of what’s to happen beyond this week, the University of Hawai’i basketball team departed Honolulu on Tuesday for its final two games of the regular season. The Warriors will play Big West Conference games at UC Davis on Thursday, then at Long Beach State on Saturday. The Big West Conference Tournament is set to begin on March 9 in Anaheim, Calif., but Hawai’i has not received word, one way or another, if it is eligible to participate. Head coach Eran Ganot has said that the decision is out of UH’s control, so all the Warriors can do is continue to win as many games as possible. Hawai’i is 14-13 overall and tied for third place in the Big West at 8-6. Pending various outcomes in other games, the Warriors could finish as high as a tie for second place, and no lower than sixth place. Two victories this week would also assure a winning record for this season – which would be quite an accomplishment considering that the program is suffering through NCAA sanctions and had to replace its top seven scorers from the previous season. This week’s games are not going to be easy. 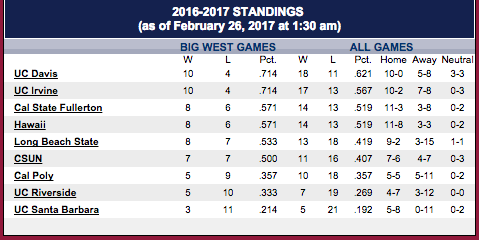 UC Davis is 18-11 overall and tied for first place in the Big West at 10-4. The Aggies already own a 76-70 win over Hawai’i on January 21 in Honolulu. What’s more, UC Davis is undefeated (10-0) at home this season. Long Beach State is 13-18 overall and in fifth place in the conference at 8-7. The 49ers, who are 9-2 at home this season, do not have a game earlier in the week, and thus have the full week to prepare for the Warriors. Hawai’i defeated Long Beach State, 114-107, in an epic overtime battle in Honolulu on January 14. UC Davis and UC Irvine (17-13, 10-4) are the only two teams still in contention for the regular-season championship. The teams will play at Irvine on Saturday in what essentially will be a championship game. There are few institutions that I hate more than the NCAA. Hurry the F up! I hate the NCAA. I wish they would hurry up and make a F’in decision.